German filmmaker, media artist and activist Florian Schneider ambitiously set out to present a mission statement for a novel type of documentary, the open source mode, and launched into a highly theoretical and somewhat cryptic talk that contained a few guidelines on how this transition can be made, but lacked any clear examples or results. 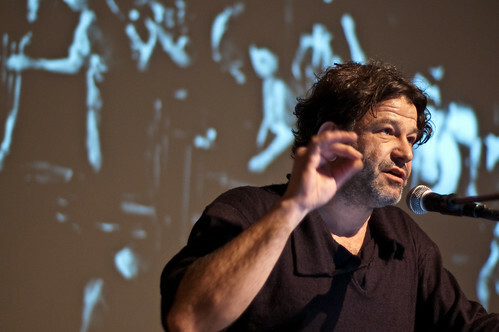 He started by explaining the moving images that ran in the background throughout his presentation, namely scenes from the first Dutch sound film and one of the first documentaries in film history, ‘Philips-Radio’ (known in France as Symphonie Industrielle). Made in 1931 by Joris Ivens after a commission from Philips Eindhoven, the film shows the mass production of radio transistors at the corporation’s factories. 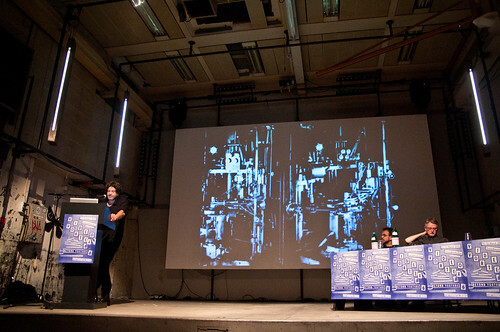 Schneider proceeded to question the possibility of a ‘Philips-Radio Revisited’, of making a documentary about a fragmented, discontinuous post-industrial space. Ivens found himself in the very midst of production, while nowadays it’s impossible to visually reconstruct the technical aspects and social division of production; this network cannot be traced. The aesthetic potential of the contemporary network should become the main focus of documentary makers, as opposed to emphasising only the creation and distribution of content. Schneider believes that what is at stake is the production of a new vision, an optical experience. In other words, it’s not about ‘what to see’ but ‘how to see things’, meaning that a number of challenges must be considered: ethical, political and especially aesthetic ones. He is calling for a reinvention of the documentary under network conditions, keeping in mind that the network logs, captures, records and stores interactions between subject and object. Schneider first elaborated on the status quo of the documentary. First, there has been an emancipation of this genre from its typical carrier media – film and photography – and an expansion into other fields, such as painting, theatre and other artistic forms. Another crucial development is digitisation, which has redefined editing; to edit can now mean to connect data streams instead of splicing 16 or 35mm film. The network has replaced or engulfed ‘the streets’ on which the filmmaker would wander in the quest to (re)appropriate a reality that exists independently from the hermetic space of the creator’s studio. In this quest, the documentary filmmaker waits something to happen, for the unexpected to occur; this notion of anticipation reverberates into the editing process as events are reconstructed with the same frame of mind. He then expressed a series of concerns about how film is made in the networked environment. In this context, there is a tension between legible and illegible, with a strong tendency for making things readable and decipherable in order to be searched, found, categorised, indexed tagged and subjected to an algorithmic process. Schneider controversially claims that text-to-image hybrids (i.e. subtitles), which can be indexed, represent death to film since they make everything calculable. This anti-computationalist perspective continues with his recommendation of an algorithm that produces difference rather than sameness, multiplicity instead of identity, since online aesthetics are all about weaving items into a mesh of similarities instead of discontinuities. Nevertheless, the network allows the filmmaker to explore an absolute out of field, to work with sources not originally captured in frames given that the content of the image always escapes proper framing. The essence of the network image, what makes it mobile is that there is no chance to readjust it. Ending with an open question – ‘What is networked seeing?’, Schneider left the audience eager to find out exactly what an open source documentary would look like. Maybe that will be answered at next year’s Video Vortex.